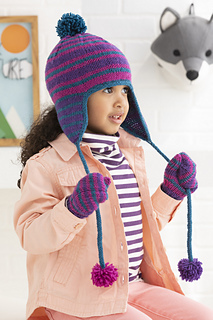 The hat is worked in stockinette in a combination of four- and two-row stripes. Earflaps are knit first separately before stitches are cast on for the edge, joining the flaps to work in rows to the top and sewing the back seam. I-cord edging, ties and pompoms are attached.